How Can I Sign Up for an LSU Dining Meal Plan? You may sign up for a Meal Plan through your PAWS account after you are registered for classes. Once you are in your account, simply go to Registration Services, then Additional Services. Enter the corresponding Service Code for the Meal Plan you would like to choose. Meal Plan charges will be added to your Fee Bill if it is before the deadline for processing. If you sign up before mid-July, it will automatically be added to your Fee Bill. If you are a first-year or second-year student living on-campus, you must sign up for an LSU Dining Meal Plan. Students living in East Campus and West Campus Apartments are exempt from the Meal Plan requirement since they have full kitchens. If you do not sign up for one, the Tiger Plus will be assigned to you. You have until the 14th class day to make changes to your Meal Plan at the beginning of the Fall and Spring semesters. You may sign up for a Meal Plan anytime on through the myLSU Portal. Contact the Tiger Card Office at 578-4300 for more information. You may also make changes to your Meal Plan via myLSU until the 14th day of class. 2. Select Registration Services | Additional Services. 2. 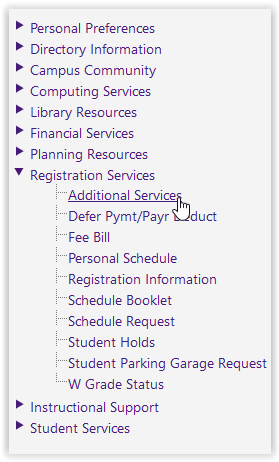 Select the campus and semester, then click View Options. 4. The charge for the Meal Plan will be added to your Fee Bill. NOTE: First- and Second-year students who are living on-campus: You must sign up for an LSU Dining Meal Plan. If you fail to do so, you will automatically be assigned the Tiger Plus Meal Plan. This does not include second-year students living in East Campus or West Campus Apartments. For more information concerning meal plans, contact the Tiger Card Office at www.dineoncampus.com/lsu OR (225) 578-4300.